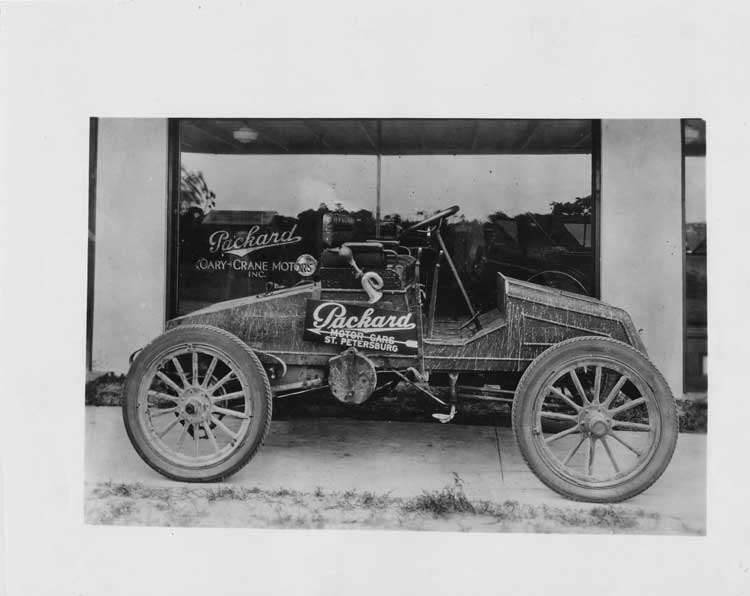 7.5x9.5 black and white photograph of a 1903 Packard Model F with sign 'Packard Motor Cars St. Petersburg.' Inscribed on photo back; 1-cylinder, 12-horsepower, 88-inch wheelbase, 2-person roadster. Used in the transcontinental crossing June 20-August 21st, 1903, a total of 5600 miles from San Francisco to New York. The driver was E.T. (Tom) Fetch from the Packard Warren, Ohio plant and passenger Marius C. Krarup, editor of The Automobile. 'Old Pacific' also participated in the First Annual Endurance Contest of the NAAM, on October 7-15th, 1903 from New York to Pittsburgh as contestant #16 class D, driver E.T. (Tom) Fetch, observer E.H. Lowe. Photo taken outside Cary-Crane Motors, Inc., Packard agents, St. Petersburg c.1924.